When the British explorer James Cook (November 7, 1728 – February 14, 1779) embarked on his first scientific expedition, he took with him an assignment from the Royal Society—to observe from Tahiti the transit of Venus across the Sun—and a confidential mission from the British Admiralty—to search the South Pacific for any signs of the Terra Australis Incognita (unknown southern land) believed by the Royal Society to exist. Having observed the astronomical transit, the HMS Endeavour captained by Cook sailed westwards where it ran aground on the Great Barrier Reef on June 11, 1770. The crew spent more than six weeks repairing the ship on a nearby beach at the mouth of a river—which Cook named Endeavour—where they made contact with native aborigines, who have known about this natural wonder for centuries. Satelite image of the Great Barrier Reef in 2001. Credit: NASA/GSFC/LaRC/JPL, MISR Team. Beloved by Australians, the reef complex—whose origins go back to the Miocene epoch, faces significant threats that are putting at risk its survival and the species that inhabit it. “A reef such as one speaks of here is scarcely known in Europe. It is a wall of coral rock rising almost perpendicular out of the unfathomable ocean,” wrote Joseph Banks, one of the botanists of Cook’s expedition, obviously impressed. His description was very accurate. This immense natural belt is formed by about two thousand reefs and nearly one thousand islands. Its extent covers more than 344,000 square kilometres, to the northeast of Australia, and is composed of living coral that grows on dead coral. It is precisely this lifeless colonial animal that makes up the great walls of stone that Banks referred to, which in some places measure up to one hundred metres in height. 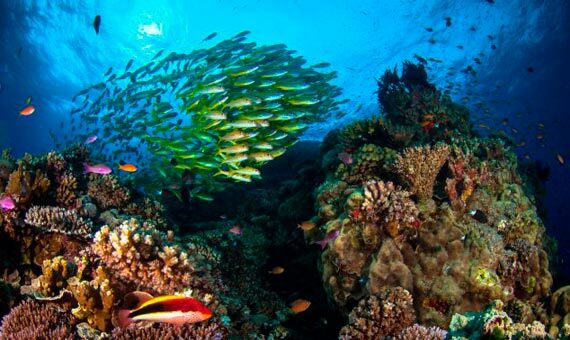 The reef complex faces significant threats that are putting at risk its survival and the species that inhabit it. Credit: Matt Curnock. as sponges, fish, worms, starfish, turtles, molluscs or crustaceans. Cook was not the first European to discover the marine enclave. It seems that the Portuguese were there in the sixteenth or seventeenth centuries, although the British expedition was a pioneer in describing it scientifically, and in doing so, European researchers learned of its existence, including Charles Darwin. Although the British naturalist did not come to observe the reef from the Beagle, he wrote about it thanks to texts from other explorers. Despite being protected by UNESCO and the Great Barrier Reef Marine Park Authority, the reef is in danger. The culprit is the rise in temperatures. Earlier this year, using images from the Sentinel-2 satellite of the European Space Agency, scientists observed discolouration. This phenomenon, which had already been verified on site, was confirmed by photographs taken from space. Bleached Acropora coral (foreground) and normal colony (background), Keppel Islands, Great Barrier Reef. Credit: Acropora. According to Chris Roelfsema, a researcher at the University of Queensland (Australia) and director of the Great Barrier Reef Habitat Cartography Project, discolouration is the biggest threat to the coral reef and is the most difficult to control because of change climate. “The waters around the corals have increased their temperature more than normal,” explains Roelfsema, who took pictures of the area in January and April, which confirmed the satellite’s observations. The discolouration or bleaching occurs when the algae that live in the tissues of corals—which capture the energy of the Sun and give colour to the coral—are expelled by the increase in temperature of the water. 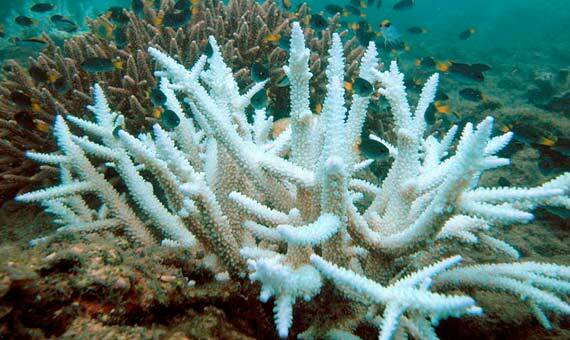 Although corals can recover, they can also die, losing their colour and turning white. So far, the Great Barrier has suffered two such episodes in the last two years. But whitening is not the only threat from the reef. The impacts of cyclones, such as Debbie earlier this year, and the proliferation of the thorn-crowned starfish, which devours living corals, also threaten the survival of the barrier reef. Scientists believe that these two factors were responsible for the largest coral decline before 2016. In the last quarter of a century, the reef has lost half of its living coral cover. These threats are having an impact on species living around corals such as two types of dolphins (the Australian snubfin dolphin and the pink dolphin of Hong Kong) considered to be at risk of decline, dugongs whose population in the centre and south of the reef has fallen by 95%, and some species of sharks, among them the speartooth shark, which has disappeared from the east coast of Australia. Sea grasses are also dwindling, which are fed on by dugongs and green turtles. 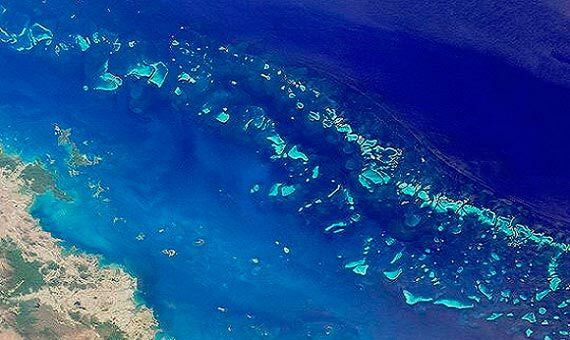 The Great Barrier Reef is, after the Antarctic ice sheet, the largest living structure that can be seen from space. Its incalculable ecological value prompted UNESCO to name it a World Heritage Site in 1981. It is a natural treasure that Australians feel is part of their identity. “It’s an iconic ecosystem that has a profound influence on Australians across the country,” says Jeremy Goldberg of the College of Business, Law and Governance at James Cook University (Australia). Goldberg led a study in which researchers asked about two thousand Australians different questions about the reef. 77% said they felt that the Great Barrier Reef was part of their identity as Australians and 54% said that it would affect them personally if the Great Barrier were harmed. In view of the degradation of the ecosystem, lawyers from Environmental Justice Australia have called for the Great Barrier Reef to be included on the list of endangered World Heritage sites.